Powered wheelchairs segment in the global wheelchair and components market is expected to remain dominant in terms of both value and volume over 2016–2026. 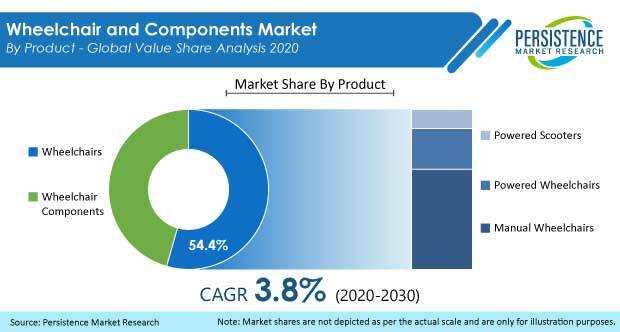 Among all product application segments in the global wheelchair and components market, revenue from the powered wheelchairs segment is projected to lead with a CAGR of 3.8 % during 2016–2026. This segment is expected to remain dominant and is expected to account for more than 20% value share in 2016. This segment is estimated to gain significant market share by 2026 end. Demand for powered wheelchairs across the globe is expected to increase significantly owing to factors such as ease of mobility and development of advanced features such as service alerts, battery alarms, and much more in powered wheelchairs. Another factor expected to fuel demand for powered wheelchairs over the forecast period is the introduction of affordable and hence easily accessible wheelchairs in developing economies. Apart from these factors, one of the major components which is creating a robust development in the demand for powered wheelchairs is rising spinal cord injuries among elderly people across the globe. Spinal cord injuries in persons aged over 65 years have increased from 88 per million in 2009 to 122 per million in 2014 globally. Growing rate of spinal cord injuries, resulting in disability and mobility issues across the globe has been playing an important role in driving demand for powered wheelchairs. Artificial intelligence, electronic control drivetrains, multistage gearboxes, and improved power capacities in powered wheelchairs are some of the advanced technologies that are expected to drive the global wheelchair and components market in the coming years. Various manufacturers in the North America region are engaged in producing high-quality wheelchairs with advanced technologies such as the use of sensors in wheelchairs to gauge the surroundings, GPS devices, and motor control software to control wheelchair functioning. Key players operating in the North America wheelchair and components market supply powered wheelchairs to countries across Europe, Asia Pacific and Latin America. The powered wheelchair segment of the North America wheelchair and components market is expected to register relatively higher CAGR in terms of value over the forecast period. Improved wheelchair friendly infrastructure in Latin America is expected to support the growth of the powered wheelchairs segment during the projected period. The powered wheelchairs segment is estimated to represent absolute dollar opportunity of more than US$ 3 Mn in 2016 over 2015 and is anticipated to represent incremental dollar opportunity of more than US$ 70 Mn between 2016 and 2026. An increasing number of favorable government regulations for disabled persons in the region is one of the main factors responsible for driving the growth of the powered wheelchairs segment in Latin America. The various key players across the globe are introducing innovative technologies in order to expand their product portfolio in the powered wheelchairs segment. For instance, U.S. based Pride Mobility Products Corp. launched Q6 Edge 2.0 powered wheelchair, which is a consumer inspired technology that offers users an elevated seating system. The main motive behind offering these innovative and execution driven features is to help the end users in leading an independent lifestyle. Cedar Composites Technology Co. Ltd.